If you work for a company, you might be able to get your boss to buy you a Personal Digital Assistant (PDA) that helps keep track of appointments, phone numbers and addresses and other important business data. If you're self-employed, you could easily justify writing off such an investment on your tax return. But would your boss or the IRS let you get away with expensing a device designed to watch videos, listen to music and display your personal photographs? I'm no tax or business ethics expert, but it strikes me that you might get away with it, if that entertainment device also happened to be a full-featured PDA. That's exactly what you get with Palm's new LifeDrive — a new category in handheld products that combines all the traditional features of a Palm PDA with some new ways to view and listen to your personal entertainment. Click here to listen to Larry's interview with Stephane Maes, palmOne's director of product marketing. Though this is the first Palm optimized for video and audio, it's not the first PDA capable of playing multimedia nor is it the first hybrid from Palm. 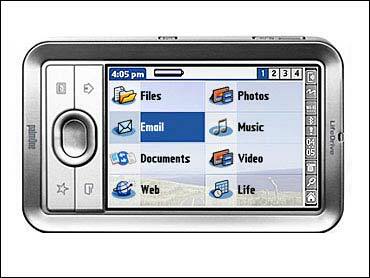 The Palm Treo 650 — a combination PDA and cellular phone — has done quite well because it doesn't force users into too many compromises. While the rectangular device isn't the perfect shape and size for a cell phone, it's close enough and the company made no compromises when it comes to PDA functions. Also, unlike many Palm PDAs, it has a small built-in alphanumeric keyboard. It's not exactly heaven for touch typists but — for many — it beats having to use a stylus to handwrite on the screen. Of course, you can do that if you want, but personally I think the keyboard was a great addition. Having ventured into phones, Palm is now turning its attention to entertainment. The new Palm LifeDrive mobile manager may look like a slightly oversized PDA, but it can also play music, display photos and even show movies. What's more, because it is equipped with both WiFi and Bluetooth wireless communications, it can also be used to access the Internet from any WiFi hotspot or — in combination with a Bluetooth cellular phone — from virtually anywhere. WiFi is the technology that lets you access the Internet from "hotspots" which generally extend about 200 feet from an access point. Bluetooth allows devices to communicate if they're within a few feet of each other. If you have a Bluetooth enabled LifeDrive in your hand and a Bluetooth enabled cell phone in your pocket, the LifeDrive can access the Internet via the cell phone. One difference between this and other PDAs is that the LifeDrive has a 4 gigabyte hard disk which gives it enough storage to handle thousands of songs or even a handful of full length movies. And speaking of movies, mine now has copies of several DVDs from my collection. Palm offers a companion CD with a copy of Pocket-DVD Studio Lite from PQDVD.com. This software makes it possible to convert a commercial DVD into an AVI file that can then be copied to the LifeDrive. I was surprised that the motion picture industry's copyright police allowed palmOne to offer this program because of industry concern about anyone duplicating commercial movies, even for personal use. But Stephane Maes, palmOne's director of product marketing, said that it passed the scrutiny of the company's legal department. "Our legal department had spent a lot of time looking at it" and said that it does pass legal muster as long as the user only makes copies of movies that they have purchased — not rented. Unlike DVD duplicating products that have been banned by some courts, this software doesn't copy the DVD itself but creates a greatly scaled down copy of the movie with significantly lower resolution than the DVD itself. Still, movies distilled with the software look fine on the LifeDrive's 2¼- by 3¼-inch screen. By the way, because the software creates standard AVI files, they can also be played on PCs. Even if you don't have a LifeDrive or other PDA, you can purchase Pocket DVD Studio for $34.99 from PQDVD.com. Most PDAs are designed to be viewed in "portrait mode" which means that they are taller than they are wide. By default that's also the case with the LifeDrive but a button on the unit flips it into landscape mode which is perfect for watching videos. There is a built-in speaker as well as a stereo headphone jack and a built-in microphone. The device also has a slot for a SD card which enables you to add up to an addition gigabyte of memory or storage. You can also use that SD slot to transfer photographs from an SD-equipped digital camera to the LifeDrive's hard drive. After the transfer, you can erase the SD card and use it to take more pictures. The LifeDrive, which measures 4.76 inches height x 2.87 inches width x 0.74 inches thickness weighs 6.8 ounces and costs $499. Of course, this is a full Palm PDA so it also comes with all the usual personal information software and can run any of the thousands of third-party applications written for other Palm devices.